Third terror attack in one day: Terrorist stabs Border Police officer in Nahariya, Israel's northernmost coastal city. A Border Police officer was stabbed by a terrorist in the city of Nahariya, in northern Israel, on Friday evening. The officer, who was moderately wounded, was taken by paramedics to the hospital in Nahariya. 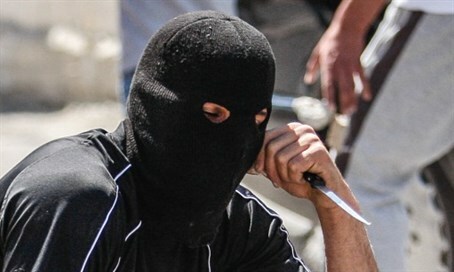 The attacker, who fled the scene after the attack, was captured by security forces after a manhunt and taken in for questioning. He reportedly claimed during interrogation that he had stabbed the officer in self defense, after an argument broke out between them. Nahariya is the northernmost coastal city in Israel, located some 30 kilometers north of Haifa. The attack is the third terrorist attack against Israelis on Friday. Earlier in the afternoon, a Palestinian Arab launched a car attack against Israelis at Bayt Umar junction in southern Gush Etzion, just after 12:30 p.m.
Five IDF soldiers in their twenties were injured in the attack; four are listed in light to moderate condition with wounds to the limbs, one is listed in light condition. On Friday morning, around 7:30 a.m., two soldiers were injured in a car attack at Kfar Adumim Junction, located outside Ma'ale Adumim to the east of Jerusalem.